Removes old layers of polish prior to re-varnishing. 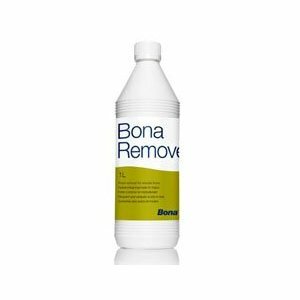 The Bona Polish remover is a concentrated product which is suitable for removing other Bona products such as Bona Polish and Bona Freshen Up but also other similar products. Scuff marks and often shoe marks can also be removed. For use on finished wooden floors. Removes Bona Polish and Freshen Up and similar products. This concentrated remover is non-flammable and non-toxic. Many polishes can be removed with this product. Its main use is for preparing a floor before it requires re-varnishing or re-lacquering. For example if your floor was varnished previously and over time a polish has been used on it then this product can be used to remove dirt, grease, shoe marks, scuff marks and much more. Once that has been done your floor can then be re-coated with a suitable varnish or lacquer. Usually it is necessary to dilute this product with 1 part of the Polish Remover to 5 parts water. For example: old coats of Bona Polish can be removed by mixing 1 litre of the Polish Remover with 5 litres of water. Alternatively scuff marks can be removed by mixing 1 cap full of Polish Remover with 100ml of water.